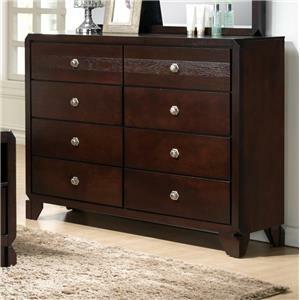 Put this dresser in your bedroom for a storage piece with traditional beauty. 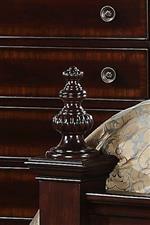 The wood features a bold shade of brown with some fading around the drawer's edges for a touch of subtle detailing. 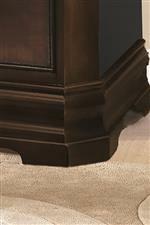 Additional detailing can be found in the molding around the top and bottom, plus the column-like edges of the piece, giving this dresser a stately appearance. 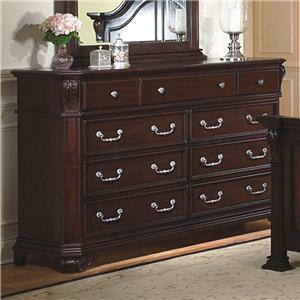 The Charlotte 7 Drawer Dresser by Crown Mark at Casa Leaders Inc. in the Wilmington, Long Beach, Torrance, Lakewood, Los Angeles area. Product availability may vary. Contact us for the most current availability on this product. 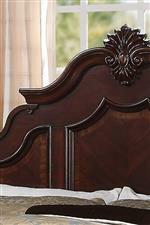 This collection boasts a traditional design that will make a grand statement in your master bedroom. Elegant and stately details are featured throughout, including decorative finials, molding and unique, flowing lines and shapes. With the pieces from this collection, you'll never want to leave your bedroom. 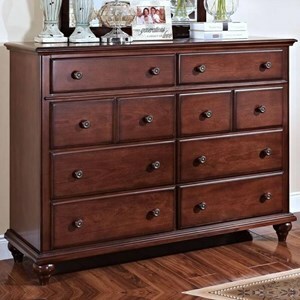 The Charlotte collection is a great option if you are looking for Traditional furniture in the Wilmington, Long Beach, Torrance, Lakewood, Los Angeles area. Browse other items in the Charlotte collection from Casa Leaders Inc. in the Wilmington, Long Beach, Torrance, Lakewood, Los Angeles area.